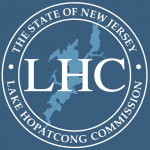 Many shallow sections of Lake Hopatcong are susceptible to an abundant density of rooted aquatic plants, commonly referred to as weeds. 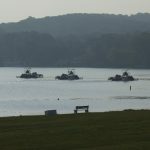 To harvest these areas, the harvester operator cuts the weeds toward the center of an infested area typically closer to the middle of the lake and will remove weeds closer to the shoreline as the harvesting is completed in that area. 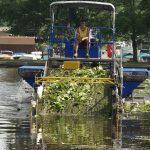 Before moving to another section of the lake, the operator will pick up floating weeds (floaters) with the harvester near the shoreline. 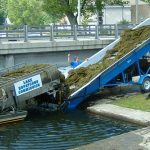 The operator will not harvest weeds near rocks, in shallow water or near bulkheads. When cutting weeds, the harvesters move at less than 5 mph and move considerably slower if the water is choppy or if it is windy. As an example, on a beautiful sunny day with no wind or waves, it takes the harvester approximately 15 minutes just to travel from the Point Pleasant in Hopatcong to the beach at the State Park when the harvester is not cutting weeds. Under the same conditions, if the harvester was cutting one pass from Point Pleasant to the State Park beach, it would take at least 30 minutes to harvest that distance. The original weed harvesters are still in operation today, making them 16 years old this year. During the off season the field staff maintain and repair the harvesting equipment to keep the machines in good working condition. 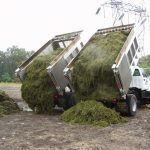 Click here to learn more about the benefits of weed harvesting. Are you interested in identifying the types of native and invasive aquatic plants found in Lake Hopatcong or to learn about notorious invasive species currently not found in the lake? If so, the Identification Manual of Aquatic Plants in Lake Hopatcong and Potential Future Invasive Species is a great learning tool.